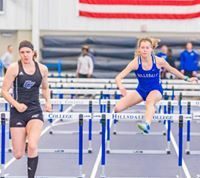 The Hillsdale College Chargers remain unde­feated in the G-MAC with a 28 – 9 victory against the Walsh Uni­versity Cav­a­liers on Sat­urday. After the win, the Chargers came in at #25 in the NCAA Division II AFCA national rankings. 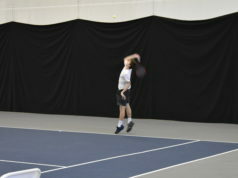 The team is also ranked seventh in the region. Saturday’s win is the Chargers’ sixth straight overall with three games remaining on the schedule. 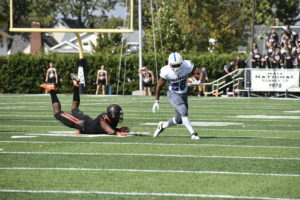 Hillsdale (7 – 1, 6 – 0 G-MAC) has already matched its win total from last season, when the team went 7 – 4. Despite a wet and rainy evening in Canton, Ohio, senior quar­terback Chance Stewart threw for 297 yards and two touch­downs against the G-MAC’s top-ranked pass defense entering play. Before Sat­urday, the Cav­a­liers had allowed just 164 passing yards per game. Both teams went scoreless in the first quarter as hail, wind, and sideways rain inhibited either offense from denting the score­board. Head coach Keith Otterbein said the Chargers ran the option play more due to the ele­ments, although it was a key part of the game plan entering the contest. As a result, Stewart carried the ball 15 times for a team-leading 58 yards. Hillsdale held Walsh to just 65 yards rushing and 222 total yards from scrimmage. As the first half pro­gressed, the pre­cip­i­tation began to clear and the Chargers began to turn yards into points. Midway through the second quarter, Stewart con­nected with senior tight end John Brennan for a 44-yard com­pletion on a 3rd and 11 to keep a drive alive. Two plays later, sophomore wide receiver K.J. Maloney’s 8-yard touchdown run on an end-around play got Hillsdale on the board. The Cav­a­liers responded with a touchdown on their next pos­session, but a missed extra point ensured the Chargers would never relin­quish their lead. Hillsdale led 7 – 6 at halftime. 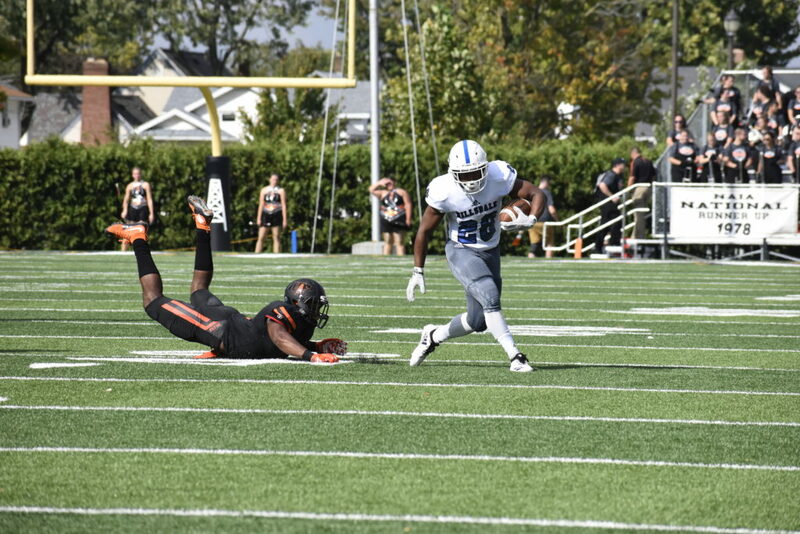 The Chargers received the ball to begin the second half, and a quick strike from Stewart to senior wide receiver Trey Brock extended Hillsdale’s lead. Brock beat his defender on a deep route for a 61-yard touchdown reception, his seventh of the season. Brock fin­ished the game with four recep­tions for 94 yards. His 98 receiving yards per game are best in the G-MAC. Junior running back David Graham carried the ball 18 times for 51 yards and a touchdown. His 10 touchdown rushes this season are the most in the con­ference. Graham’s 3-yard touchdown run extended the Chargers’ lead to 21 – 6, and Maloney caught a 32-yard touchdown pass from Stewart to make the score 28 – 9 in the fourth quarter. Maloney had a career game, catching eight passes for 125 yards while scoring two total touch­downs. His 45 recep­tions this season are third-most in the con­ference, and he and Brock combine to make the best sta­tis­tical wide receiver com­bi­nation in the G-MAC. Maloney credits his success this season in part to his quar­terback. Stewart leads the con­ference in passing per game, aver­aging 278 yards per contest. He also leads the G-MAC in total offense, netting 297 yards per game. He was the Chargers’ leading rusher on Sat­urday, car­rying the ball 15 times for 58 yards. His 17 touchdown passes this season are tied for the con­ference lead. Aside from leading in many of the G-MAC’s quar­ter­backing sta­tis­tical cat­e­gories, Stewart, in his last season, is making a run at Hillsdale’s all-time passing records. His 62 career touch­downs are five short of Troy Weatherhead’s Hillsdale record of 67. Weath­erhead is a 2010 graduate. Stewart is also just 846 passing yards shy of Weatherhead’s school record of 9,544 yards. Stewart needs to average 282 passing yards per game in the season’s final three games to tie the record. That is, if the Chargers have just three games remaining this season. Hillsdale’s six-game win streak is the longest the team has had since 2009, when it made the NCAA Division II Playoffs. With two G-MAC games left this year, a playoff appearance is a real pos­si­bility for the Chargers. But Stewart said the team isn’t taking any­thing for granted. 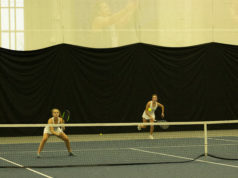 Hillsdale hosts Ken­tucky Wes­leyan College on Sat­urday at 1 p.m. The Chargers defeated the Pan­thers 56 – 0 last season, but they aren’t looking too far ahead. Otterbein’s message to the team is that each win makes the next game more important. He said his team has responded well.